Children, adults or teenagers, no matter how old you are, you are never too old for ice-cream.It is one of the most loved deserts in the world, you can see the sheer delight on kids’ faces when you present them with a cone full of ice-cream. Everyone knows when you kids’ hear the charms of the Ice Cream Van your wallet/purse is in trouble. It is not just kids that love ice-cream, grown-ups love it too. When you are at a festival or any event on a sunny day, you can see the que for the Ice-Cream Vans a mile off. Getting the best flavoured ice cream served at your events is essential so that the guests enjoy the full range of the much loved desert. Hampshire Ices is your one-stop solution to get all your ice cream related requirements fulfilled. 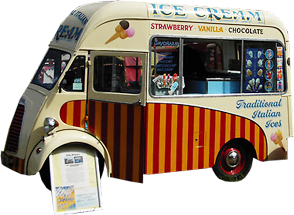 Our company excels at providing the best ice cream van hire solutions for your events. 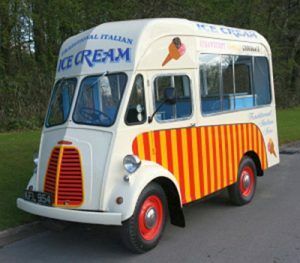 The various Ice Cream Vans that we provide are eco-friendly. We ensure that our vans have low carbon emissions and that they are fully serviced and their MOT is in date. 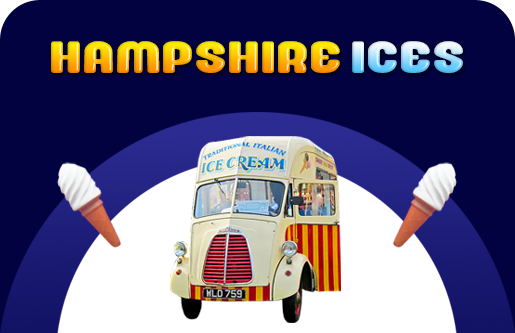 Hampshire Ices provides Vintage Ice Cream vans for hire and also various traditional and custom designed Ice Cream Vans so no matter what event you are hosting we have an Ice Cream Van for it. Our main aim remains at providing the top quality ice cream so that your occasion becomes a complete hit among the visitors. Our service in Surrey is two decades old and our reputation is only getting better as we keep receiving positive feedback from each and every one of the clients.